← Meet Fix Your Drink in person March 27! Fix Your Drink and Seasonal Bounty will be at Barcelona/Fairfield on 3/25. Click the image for details and to RSVP. We’ll admit–much of the current renaissance of cocktail culture has been fueled by the cultish popularity of those lovable, hard drinking characters on Mad Men. We just try to add some 21st-century flair to Don Draper’s approach of “Pour Scotch, ice optional,” and play down the “don’t let me see the bottom of this glass” component. To celebrate the long-awaited return of the show, our friend Nina Sutton has created an event with her Seasonal Regional Cooking & Dining Meetup.com group to help celebrate the event, and we’re going to be part of it! It’s taking place at Barcelona in Fairfield, CT on 3/25 between 6-8p (enough time to get home and watch the show!). The event is $20, and includes tapas and half-price wine. 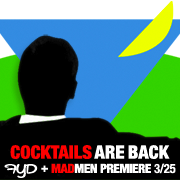 We’ll be featuring some Mad Men era cocktails, too… please keep in mind that it’s a cash bar. We’re really looking forward to seeing the “Seasonal” group regulars… and we hope you can join us, too. The Spirit The Spirit is a free, thrice-weekly email for cocktail lovers and spirit enthusiasts. Museum of the American Cocktail Nonprofit providing mixology education and preserving the history of the American cocktail. Vermouth 101 Everything you need to know. And keep it in the fridge. The Wormwood Society Non-profit providing accurate information about absinthe. KegWorks Supply your bar–beer and more. Since 1998 in Kenmore, NY. Specialty Bottle Make your own bitters? Get bottles here. Fix Your Drink: Available Soon!